Khaman is made from besan or chana daal whereas Dhokla is made from a mixture of rice and urad or moong or any non-chana daal. 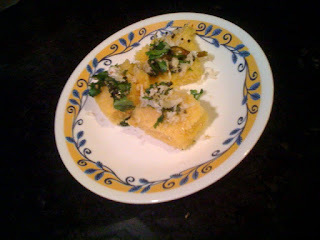 Thanks to Madhu ben I tried to make Khaman at home - from the ready to cook Khaman pack ;-). Since the recipe for ready-to-cook khaman is written on the pack itself - I won't bore you with that.. This quick post is about a tip for the tadka..
Once Khaman/Dhokla is ready, make tadka with oil, mustard seeds, curry leaves, green chili and white sesame seeds. Once the tadka starts to splutter add about a cup of water in the tadka and let the water heat a little bit with the tadka.. now add a spoonful sugar in this mixture and stir well. Pour this mixture over the khaman! Adding water to the tadka is a real nice way to get a soft, moist texture and a slightly sweet taste. Thanks for sharing this great tip Anuja. You made me hungry :). I will try it out soon.